The death of your significant other’s parent is a uniquely challenging time in your relationship. Your partner will be grieving in their own way. Depending on what kind of relationship you had with their parent, you will be, too. Whether you were close or not, the death of your partner’s parent will be a strain on your relationship. Many people experience unexpected emotions when their partner’s parent dies. It might impact you in a way you didn’t anticipate. Losses from your past may creep up making fresh emotions feel even stronger. With all these sentiments to sort through, taking care of yourself and your partner might be tricky. Although each situation is different, there are some universal themes that come up when your partner’s parent dies. Here are three things to keep in mind to help make this process be a little bit easier. When you love someone, it’s hard to see them suffering. No matter if they’re experiencing physical or emotional pain, you want to offer them a reprieve if possible. You may feel that the compassionate and loving thing to do is to try to “fix” it. 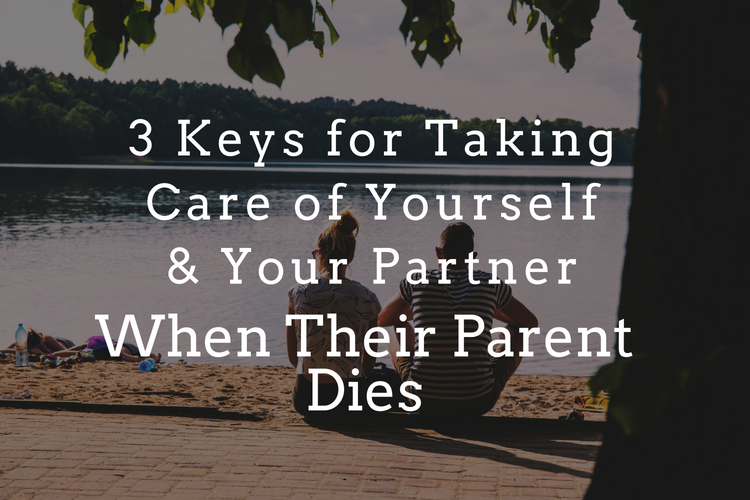 But, when your partner’s parent dies, love and compassion take on a different form. There is no “fixing” grief. This may leave you feeling helpless, frustrated or scared. It’s hard to watch the person you love suffer and feel like there isn’t much you can do to make things better. You might feel like you are the one holding your relationship and family together. Even if you are a family of two, you may be the “glue” as your partner is going to be less emotionally available at this time. They may be crying often, sleeping a lot, or engaging in numbing behaviors with alcohol, food, or TV. Furthermore, they may be short-tempered and irritable. Grief shows up in different ways for different people and it’s challenging to allow your partner to go through it. Understand that during this initial grieving period, your partner may feel like they are on an emotional rollercoaster and you may feel like that, too. For both the griever and their circle of support, the unsteady emotions could be difficult to navigate. You’ll likely have to rely on your intuition and insight to know when to step back or when to step in—though it’s typically helpful to falter on the side of giving them space. If you’re uncertain about how to best support them, ask them. A simple “Honey, I love you. How can I help?” can go a long way. It’s not uncommon for old feelings and memories to return when your partner’s parent dies. Experiencing loss has a way of stirring up the emotional pot. The situation might remind you that you will one day lose your own parents. Or if you’ve already lost a parent, it could easily make you think back to that painful time. The strong emotions that you felt back then may re-emerge. It’s helpful to know, after someone dies, that whatever feelings of loss you experience are okay. Although these emotions might be painful, if you can acknowledge and feel them, they will eventually move through you. Current losses often evoke past losses of all kinds. So don’t be surprised if you find yourself feeling sad over things that you thought you worked through in your past. These past losses may have nothing to do with death but may be losses around missed opportunities that you can’t get back, like not having children or not taking a certain career path. Try to be gentle with yourself and remember that, although you are in the role of supporting your partner in their grief, you also need to tend to yourself. When your partner’s parent dies or anyone else close to you passes away, it’s only normal to think of your own mortality. It’s an odd thing about being human; we all know we are going to die, yet many of us do everything in our power not to think about this fact. For some, thinking of death stirs up anxiety-ridden thoughts of the many unanswered questions surrounding the topic. What happens after we die? What is the point of life? These are common questions that religious and philosophical thinkers have sought to answer for centuries. If you have a belief system that helps provide answers to these questions, lean on that as a source of comfort and guidance. But, if you are like many people in San Francisco, traditional religious beliefs may not be a guiding force in your life. One way to help find meaning after death is to identify your core values and see if your life is aligned with those values. If you’re not sure what your core values are or if they’ve changed over time (which they often do) a good way to begin to identify your core values is to think about what’s really important to you in life. What matters most to you? Time spent with loved ones? Social-justice? Creativity? Meaningful work? Although these questions may feel like a lot at first, allowing yourself to stay with them could eventually produce positive change in your life. You may get clarity on shifts you need to make so your life is filled with things that are deeply meaningful to you. *Do you need extra support with your relationship following the loss of your partner’s parent? Call (415) 310-5142 to get started with therapy in San Francisco. We offer individual therapy, couples therapy, and adherent DBT.